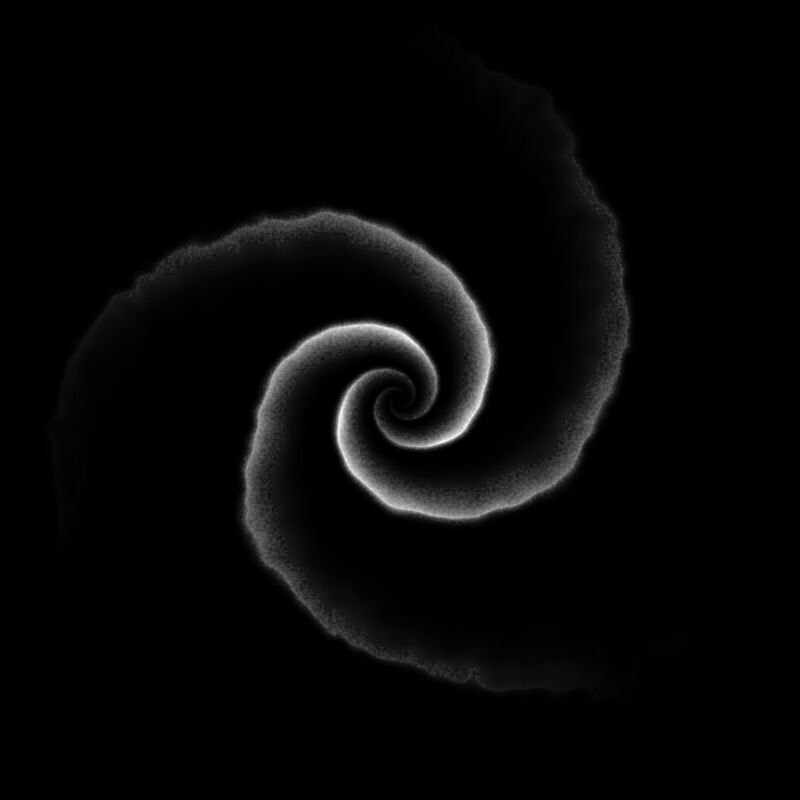 I started implementing procedural galaxies. This is not a 3D models of galaxies, but generation of billions of galaxies in an almost infinite space. Procedural 3D models will be the next step, and until then, all galaxies are using standard models. The first screenshot shows some procedural galaxy. 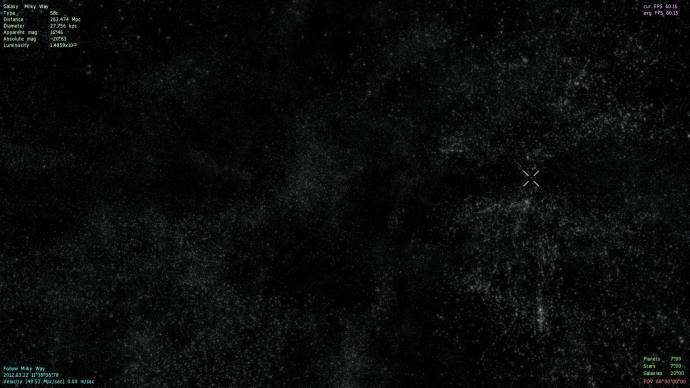 The points on the background are not stars, but galaxies! Note the name (identifier) ​​of the galaxy. It has the same form as the name of a procedural star has: (universe sector number)-(universe node level)-(universe node number)-(galaxy number in node). 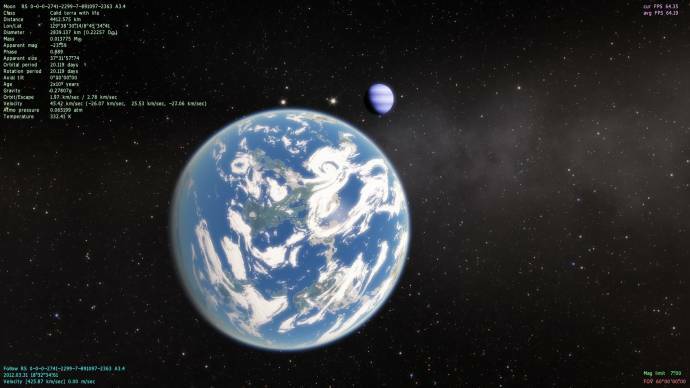 The third screenshot shows some procedural planet in this procedural galaxy. There is no problem with jittering of the camera while it moves - the new coordinate system (128-bit fixed point numbers) is working fine. Note the name (identifier) ​​of the planet. Now these monstrous numbers will be used: (universe sector number)-(universe node level)-(universe node number)-(galaxy number in node)-(galaxy sector number)-(galaxy node level)-(galaxy node number)-(star number in node). However, for the catalog galaxies, I can save the old system - they have no universe node or sector, but only the catalog number. In this first test I create only a small piece of the Universe - a cube with sides of about 10 gigaparsecs (32 billions light years). For now galaxies are distributed uniformly in it, but next time I'll implement a simulation of large-scale structure of the Universe - the galaxies will group into clusters, filaments and "walls". Also, I will make cut-off galaxies, which are far away, more than 13.7 billions light years, and a gradual reddening of the galaxies approaching in the distance (red shift simulation). 13.7 billion years is the age of the Universe, so that the light from the galaxies that lie beyond 13.7 billion light-years has not yet reached the observation point. And this is true for any point in the Universe. The Universe itself, depending on the cosmological model, is infinite or has the form of a four-dimensional hyper-sphere with the length of the equator at 50-100 billion light years, and is uniformly filled with galaxies. I will most likely close the model - infinity is hard to implement on a computer. So in the next release you can not leave the Universe, as shown in some videos on YouTube. You will simply make a "round trip" and go back to the starting point. This looks incredible already, can't wait to see it once you've implemented the large-scale structure! Seems like you're pretty close to taking this simulator to the next level. Amazing job. This is infinity! I am sooo anxiously waiting for the next release! Please can we have a pre beta ?? Just kidding! Take your time Master of the Universe ..
"First attempt of creating the large-scale structure of Universe"
That picture is simply amazing! It looks like the caverns of the cosmos. now i wonder when is new release? Any progress with the procedural galaxy models? (especially spirals) I suppose they will be generated in the same fashion as stars and planets- no two will be alike! maybe just one picture.......? The elliptical galaxies are those I find the least interesting in S.E. right now... not that there's that much variety among them- they just don't look convincing. I'm sure I'll enjoy them more when they aren't all the exact same color and shape*. *by that I mean either perfectly spherical or a stretched sphere- they aren't that perfect... and there are plenty of disk shaped eliptical galaxies as well. They'll probably be not included in 0.96 version. 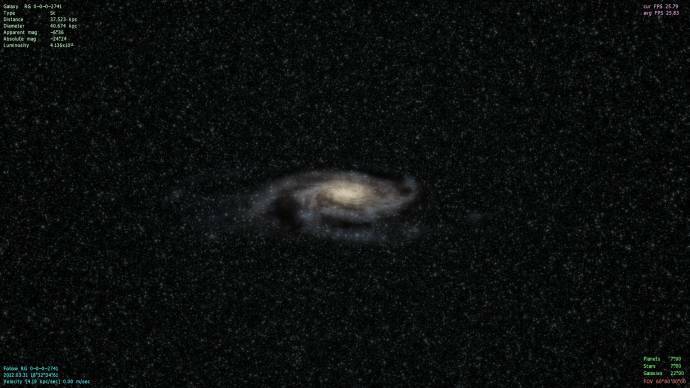 It seems there's a ways to go... for now we can call this a pinwheel galaxy. In the engine, it will be type Pn, where n is the number of arms. Why not just call it a spiral galaxy, which is what it is? In the engine, it will be type Pn, where n is the number of arms. 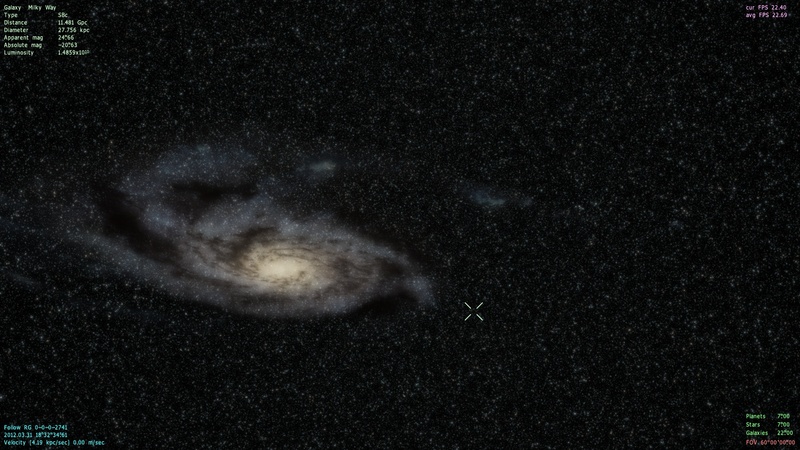 SpaceEngine already uses the Hubble galaxy classification system. It is generally more useful, since many spiral galaxies don't have a set number of well-defined spiral arms. This one would probably be Sc on the Hubble sequence. Ah. I thought you might be, but I tend to err on the side of the serious. Sorry!